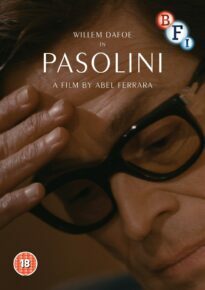 I can easily understand why some of Abel Ferrara’s biggest fans have certain reservations about his Pasolini (2014), available now on a splendid Region 2 Blu-ray from the BFI. Even if it’s a solid step forward from the stultifying silliness of Welcome to New York (2014), it lacks the crazed, demonic poetry of Bad Lieutenant (1992), The Addiction (1995), and New Rose Hotel (1998); most disconcertingly, it’s a responsible, apparently well-researched treatment of one of the most irresponsible of film artists, made by another film artist generally cherished for his own irresponsibility. And stylistically, it’s almost as if Ferrara has moved from being the great-grandson of F.W. Murnau to being the grandson of Vincente Minnelli—although one could argue, more precisely, that it isn’t really an auteur film at all. Yet as a portrait of the great and uncontainable Pier Paolo Pasolini, filtered through the last day of his life—a day focused on new creative work (a novel in progress and a film in pre-production) as well as various other activities, at home and on the street—it carries an undeniable conviction and emotional authenticity, which might make the prosaic strengths of Lust for Life (1956) a more useful model for Ferrara’s ambitions here than the poetic flourishes of a Faust (1926) or Tabu (1931). Even the mix of English and Italian dialogue, which might pose a problem for some Italian viewers, struck me as a form of honesty about Ferrara’s vantage point rather than any sort of commercial compromise. The BFI release includes two valuable extras: a wonderfully unbridled and often hilarious 23-minute interview with actor Robin Askwith recalling his work on Pasolini’s 1972 The Canterbury Tales (one of my least favourite Pasolini pictures, though for me this didn’t interfere in the slightest with the good-natured wit, gusto, and observational insights of Askwith, political incorrectness and all); and a lengthy onstage discussion with Ferrara, members of his skillful cast (Willem Dafoe, his wife Glada Colagrande, and Maria de Medeiros) and Paulo Branco, as well as an audience including Wes Anderson, which is highly recommended for its perceptive remarks about both Pasolini and Pasolini. As a onetime employee of the British Film Institute (1974–77), I can testify that the people who work there are generally split between devoted cinephiles and bureaucrats who reek of alienated labour. 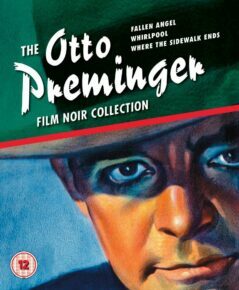 Both strains are in evidence in the BFI’s Otto Preminger Film Noir Collection, a “limited edition” Blu-ray box set that includes Fallen Angel (1945), Whirlpool (1950), and Where the Sidewalk Ends (1950), although I’m happy to report that the cinephiliac strain predominates, especially in the inclusion of expert audio commentaries by Adrian Martin provided on all three features (the first two recorded for Australian Madman DVD releases in 2009, and the latter recently produced by and for the BFI). There’s also a lively 80-minute audio interview with Preminger conducted by Joan Bakewell in 1972 on the Fallen Angel disc, accompanied by stills. But here’s where I presume a certain amount of alienated labour comes into the picture: the dozen or so stills are all from the three Fox pictures included on this set, and virtually none of the 80 minutes has any discernible relation to them. Perhaps rights issues prevented the BFI from illustrating the pictures that are discussed—ranging from Laura (1944), River of No Return (1954) and The Man With the Golden Arm (1955) to Anatomy of a Murder (1959), Hurry Sundown (1967), and Such Good Friends (1971)—but surely a single photograph of Preminger himself would have been more appropriate to the discussion than these irrelevant stills that are endlessly repeated simply to fill up space. 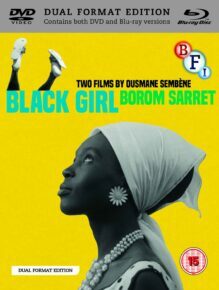 By way of contrast, the BFI’s dual-format edition of Ousmane Sembène’s first two films, Borom Sarret (1963) and La noire de…/Black Girl (1966), both restored by The Film Foundation’s World Cinema Project, is nearly irreproachable. I say “nearly” only because Samba Gadjigo writes in an accompanying essay that “Black Girl is adapted from Sembène’s own novella of the same title, published in the collection Voltaique (1962).” Perhaps this magnificent 17-page story (hardly a novella) has the same title as the film in French, but in English (where it’s included in a 1974 collection called Tribal Scars and Other Stories) its title is “The Promised Land,” and a more thoughtful edition would have pointed this out. (The story is as remarkable in many respects as the film, although it’s different in many significant respects—for one thing, it ends in two pages of non-narrative verse—and it’s unfortunate that so few people who love the film have read it.) But otherwise, I’m immensely grateful that this edition includes the alternate version of Black Girl, with a brief sequence in colour depicting the heroine’s first glimpses of the Côte d’Azur (which is lamentably ignored and left out of the New Yorker DVD), as well as two separate documentaries about Sembène (Manthia Diawara and Ngugi wa Thiong’o’s 1964 Sembène: The Making of African Cinema and D. Sentilhes and B. Josse’s 2003 Sembène: A Portrait) and a 14-minute 2005 interview with Black Girl’s lead actress M’Bissine Thérèse Diop. 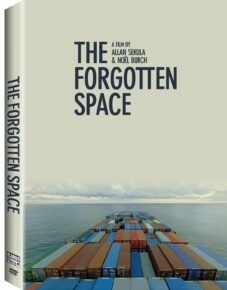 The 12-page illustrated booklet included with the DVD features a dozen of Sekula’s photographs, Sekula and Burch’s four-page “Notes for a Film,” and Burch’s preceding two-page “Essay Film,” which opens with the preposterous statement, “Forty years ago I may have been the first to launch the concept of the essay film.” Talk about “forgotten space(s)!” Assuming that this was written circa 2010, referring back to 1970, I can only further assume that Burch had momentarily forgotten, among many other essay films, Resnais and Marker’s Les statues meurent aussi (1953) and Mikhail Romm’s Ordinary Fascism (1965). How can this film of mine be categorized? This can not [sic] really be called “a documentary,” and it is also not exactly a cultural film. It also differs from an art film, an educational film and a tourist film. On the contrary, Kyoto is all of the above, and better because of it. As with Burch, some directors often have a weird habit of totalizing, universalizing, and generalizing their achievements in absolutist terms that can’t possibly correspond to their actual achievements. I guess it goes with the territory. 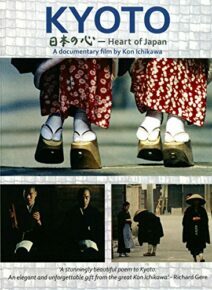 To be fair, Kyoto has a floating and shifting focus that proceeds from rock gardens to Zen Buddhism and beyond, but it has a documentary and cultural value as an educational, touristic art film on every topic it addresses. I have a lot of catching up to do with the films of Benoît Jacquot, but the two-disc Blu-ray set from the Cohen Film Collection, comprising The Disenchanted (1990), A Single Girl (1995), and Keep it Quiet (1999)—only the second of which I’d previously seen—seems to give me a healthy start. All three are accompanied by amiable discussions between Jacquot and Kent Jones, mainly in subtitled French (with an irrelevant and distracting giant Oscar lurking behind them), and by able audio commentaries by critics Wade Major and Tim Cogshell (which appear to have benefitted from the Jacquot-Jones dialogues, making for some repetitions of information, though many of the more relevant facts are worth stressing). Major and Cogshell, based on the portions of their commentaries that I sampled, are especially acute about the resilience of the young working-class heroines of The Disenchanted and A Single Girl, which they follow and chart on a moment-by-moment basis, rightly pointing out that the two features should be viewed as a diptych. I wish I could say that their enthusiasm for Keep it Quiet convinced me as well. This clearly marks a new direction in Jacquot’s work, and maybe over time I’ll learn how to adjust to it, but I was stymied here by the fact that I couldn’t believe in any of the major characters, most of whom are members of a wealthy family, much less buy that they were related to one another, either by blood or genuine fellow feeling. Jacquot himself is refreshingly concrete and practical in his remarks about the first two features, in contrast to the more abstract theorizing that infects the discourse of some of his French colleagues. (Perhaps the closest he gets to theory is one of his craftiest insights: that a director has to know when to be intelligent and when to be “stupid,” seeing both traits as operative within interpersonal dynamics.) The deep-dish cinephilia that plays into his dialogues with Jones is also entertaining (although it’s a little surprising that they focus on The Set-Up  and Cléo de 5 à 7  as “real-time” films while overlooking Rope , High Noon , and Russian Ark , among others); I especially like Jacquot’s thoughts about doors and Lubitsch apropos of A Single Girl. But when it comes to Keep it Quiet, the reference points in the discussion didn’t help me this time: Jones cites Frank Borzage’s Living on Velvet (1935), which I haven’t (yet) seen, and Jacquot mentions Dostoevsky, whom I’ve never had much affinity for. 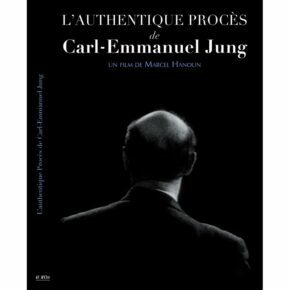 And Jacquot’s discourse in this case seems at once more theoretical (seeing the lack of connection between the characters as a conscious postulate) and more gossipy (harping on the past and present relationships between the lead actors—Fabrice Luchini, Isabelle Huppert, and Vincent Lindon—as opposed to the lead characters). Maybe if I had more affinity with these actors this would have helped me with the film, but try as I might, I still can’t get with the program. My only real quibble with this set is with its packaging, which smacks once again of alienated labour (unlike the links between the commentaries of Jacquot-Jones and Major-Cogshell). Much of the fine print on the back of the box is illegible without a magnifying glass—reminding me of the flash-by credits at the tail end of most industry trailers and their unconcealed contemptuous indifference towards the curiosity of viewers. And the eight-page illustrated booklet included inside, devoted to chapter headings and credits, omits the film’s release dates, running times, and original French titles. The absence of the latter is obviously relevant in the case of Keep it Quiet (which was originally titled Pas de scandale), but even a seemingly smaller change—when La fille seule winds up as A Single Girl—suggests a shift of emphasis that is as significant as Godard’s La femme mariée (1964) eventually becoming A Married Woman. Moreover, the booklet doesn’t bother to assign any writing credit at all to The Disenchanted, whereas both of the on-disc commentaries make it clear that Jacquot and lead actress Judith Godrèche were jointly responsible for the script. At the age of 16 in 1959, I was dumb enough—or at least sufficiently “of the period”—to take Stanley Kramer’s On the Beach seriously, and I was far from alone in this attitude. So it was largely an impulse to reassess both myself and 1959 (not Kramer) that led me to shell out $13.64 for a Korean import DVD from Amazon. Why is it that the extinction of humanity from a nuclear holocaust was a live and vital subject back then and not just a post-apocalyptic trope, as it’s more apt to be today? Is this because we can no longer entertain the notion of a few movie stars (stolid Gregory Peck, luminous Ava Gardner, Fred Astaire grim and wizened in an exceptional “straight” role, Anthony Perkins wrestling awkwardly with his version of an Australian accent, and the now-forgotten Donna Anderson) getting drunk around Melbourne while waiting for the fallout to arrive, or have we by now internalized such quaint possibilities in very different terms? And if they’re different, what are they now, exactly? How do we respond to the prospect of nuclear annihilation, or do we respond at all? Apart from being a better movie with a similar theme, Dr. Strangelove (1964) clearly had the future zeitgeist down pat in a way that On the Beach clearly doesn’t, but paradoxically this makes the Kramer film far more useful as a time capsule. What I still find affecting about this film in spite of everything (and more dramatically believable than Keep it Quiet) is the everyday manner in which characters move in and out of denial about their upcoming and inevitable extinction. Even if the movie keeps getting diverted and interrupted by hokey Hollywood standbys—Ernest Gold’s insultingly bombastic score, telling us what and how to feel whenever Kramer feels that he can’t do it all on his own (which is often), and more boilerplate romantic clinches than you can shake a stick at—something real and poignant periodically leaks through. Over half a century later, nothing could feel more unfashionable. My only quibble with the English translation of Brenez’s essay is an extremely minor one that actually pleased me: “Sur le fond d’une plastique noir et blanc en 16mm digne du Jugement à Nuremberg de Stanley Kramer (1961)…” becomes “Shot in 16mm, in front of a black and white plastic background worthy of Stanley Kramer’s Nuremberg Judgment (1961)…” After all the many years of Hanoun’s masterpiece being marginalized and ignored in favour of such Oscar-winning blunderbusses as Kramer’s, it’s a genuine pleasure to see Kramer’s film unrecognized and therefore marginalized half a century later by an English translator. A recent Skype interview I held with Whit Stillman at Chicago’s Gene Siskel Film Center after a screening of his first feature Metropolitan (1990) inspired me to revisit all three of his other features and to read his droll novelization of the third, The Last Days of Disco (1998)—outfitted with the added subtitle With Cocktails at Petrossian Afterwards—that both autocritiques and expands the film’s narrative. Stillman’s first and third features are both available on well-appointed Criterion Blu-rays, while Barcelona (1994), the second, and Damsels in Distress (2011), the fourth (and the one Stillman told me he was most satisfied with), can be had from Warners and Sony, respectively—the former only on DVD, the latter on Blu-ray with many extras for only $8.26 from Amazon, the last time I looked. Although I enjoyed all of Stillman’s films the first time around, what has made them look better to me over time is their innate tenderness towards their troubled characters, which I had previously tended to overlook given my own somewhat lazy (and incorrect) view of them as neoconservative statements of some sort, which drastically oversimplifies their dynamics. It was encouraging to discover during our interview that Stillman is both a passionate Frank Tashlin fan and a victim, as Tashlin himself was, of the sort of critical typecasting that limits the potential scope of his own projects. My only quibbles about the Blu-ray of Joseph L. Mankiewicz’s The Honey Pot (1967) from Kino Lorber and the DVD of Samuel Fuller’s Run of the Arrow (1957) in the Warner Archive Collection are their absence of extras, but this is small potatoes alongside the fact that these essential works are at long last available on my side of the Atlantic. 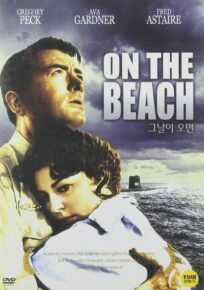 Although I’m not quite ready to call the Mankiewicz masterpiece the writer-director’s most essential work, it may have Mankiewicz’s cleverest script (in spite of all the changes he had to make in its original conception), and I’m delighted that the late, great German critic Frieda Grafe included it among her own favourites. 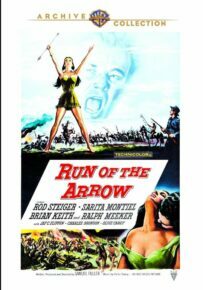 As for Run of the Arrow, it arguably features the most cantankerous hero of any Fuller feature, quite an accomplishment given the sheer orneriness of other protagonists in his work. And I have no quibbles at all about the Twentieth-Century Fox DVD of John Berry’s exquisite 1974 comedy about ghetto life and welfare, Claudine, audio commentaries and all, which has been available for the past dozen years and was purchased by me nine years ago, but which I only got around to watching recently; it can be ordered from Amazon for only $6.26.